Pear facts, an information sheet for kids cooking activities. Pear facts and general information about pears. 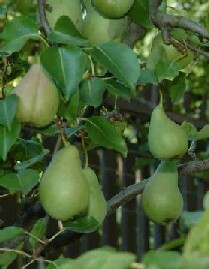 Pears grow on trees as they are a fruit. They are often picked before they are ripe and ripen off the tree. Pear should be a little soft when touched. Avoid pears that have dark spots, are shriveled or have soft spots. Allow pears to ripen at room temperature. Use as you would chopped apples in dessert recipes. Serve with cheeses, nuts or chocolate. Eat as is. They're great alongside ham or pork. Pears are high in fiber, potassium and Vitamin C. One serving size is one medium size pear. In a croissant layer ham slices, cheese slices and fresh sliced pears. Toast in toaster oven or place in microwave 20 seconds until cheese is melted. Toast walnuts on a baking sheet for several minutes in a 375 degree oven. Cool while you are making salad. Cut pears into pieces. Drizzle with honey and set aside. Add greens to serving bowl. Drizzle with olive oil. Toss pears, walnuts and cheese with greens and serve immediately. Fry pork chops in skillet in oil and butter until browned on both sides. Stir in syrup and apricot preserves. Add pear slices and allow to cook for several minutes until syrup thickens. In a bowl have child blend cream cheese and brown sugar. Have adult cut pear in half and scoop seeds out. Child can spread lemon juice over pear and then spread cream cheese mixture on top. Bake pizza crust until golden brown. Layer pears and nuts over top of pizza and sprinkle with brown sugar and nutmeg. Bake at 350 degrees for 10 minutes or until sugar is melted. Serve a slice of pizza with a scoop of vanilla yogurt on the side. Try adding chopped or pureed pears to your pancake batter for a little extra nutrition and flavor.